Whether you are an experienced or novice knitting teacher, you know the enormous amount of work that goes into planning a knitting class. The teaching modules below are designed to lift some of that weight off your shoulders. Each module gives detailed guidelines on how to prepare for and teach a specific technique. With purchase of a module, you will receive step-by-step instructions about what materials you will need to teach the class, what you as the teacher need to prepare in advance, a detailed schedule of what to do in class and how to teach different techniques — along with a handout and class project pattern to distribute to students. I have 13 years of experience of teaching both knitting and history, and have a reputation for innovative and well-considered course design. If you are not satisfied with the module, you are welcome to return it for a full refund. Click here to purchase this module on the Ravelry website. Everyone who knows how to knit should teach at least one other person to share in this satisfying craft of ours. Whether you plan to teach one person or a whole formal class, this ten-page guide will help you prepare for and teach a three-session beginning knitting class. In this guide, you will find: the steps you need to follow to prepare to teach the class, issues to think about before you teach, a detailed syllabus of techniques to cover in each session and how to approach teaching them, and a stylish but simple hat pattern (pictured at left) that your students can use as their first project. 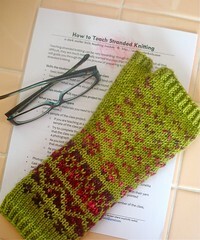 Teaching stranded knitting can be very rewarding: though the techniques are not all that difficult, they are much more easily learned in a class than from a book or video. This module will guide you through the entire process of preparing to teach – and teaching – a three-hour course on stranded knitting. The module includes a pattern for a class project: simple, worsted-weight fingerless mitts (pictured at left). Teaching the magic loop technique provides a great opportunity to reach that “aha” moment with your students – the technique really does have a kind of magic to it that can salve the beginner knitters’ despair at double-pointed needles. This module will guide you through the entire process of preparing to teach – and teaching – a three-hour course on the magic loop technique. 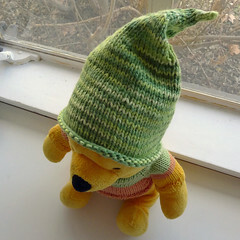 The module includes a pattern for a class project: a simple, elfin baby hat (pictured at left). You have created a high-quality teaching aid. I don’t think I have ever received such a good-looking, detailed and useful handout at a class. — Nancy N.